This an optimization story that should not surprise anyone using the Django ORM. But I thought I'd share because I have numbers now! The origin of this came from a real requirement. For a given parent model, I'd like to extract the value of the name column of all its child models, and the turn all these name strings into 1 MD5 checksum string. Same SQL gets used this time as in version 3. I ran this on my PostgreSQL 11.1 on my MacBook Pro with Django 2.1.7. So the database is on localhost. 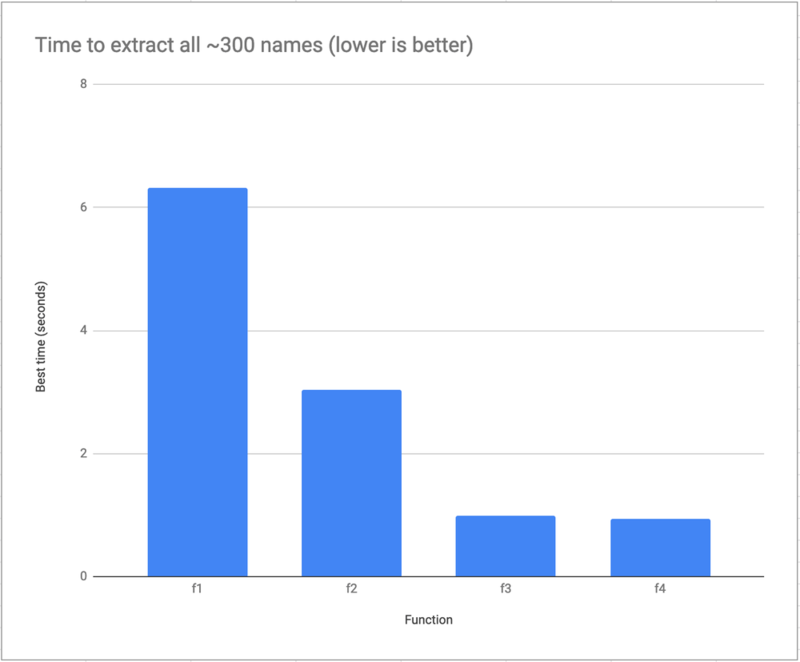 I guess the hashlib.md5("".join(names).encode("utf-8")).hexdigest() stuff is a bit "off-topic" but I checked and it's roughly 300 times faster than building up the names list. It's clearly better to ask less of Python and PostgreSQL to get a better total time. No surprise there. What was interesting was the proportion of these differences. Memorize that and you'll be better equipped if it's worth the hassle of not using the Django ORM in the most basic form. Also, do take note that this is only relevant in when dealing with many records. The slowest variant (f1) takes, on average, 7 milliseconds. James suggested, although a bit "missing the point", that it could be even faster if all the aggregation is pushed into the PostgreSQL server and then the only thing that needs to transfer from PostgreSQL to Python is the final result. By the way, name column in this particular benchmark, when concatenated into one big string, is ~4KB. So, with variant f5 it only needs to transfer 32 bytes which will/would make a bigger difference if the network latency is higher. Result: f5 is takes 0.793ms and (the previous "winner") f4 takes 0.788ms. I'm not entirely sure why f5 isn't faster but I suspect it's because the dataset is too small for it all to matter. So that accounts from ~0.1ms difference only! Which kinda matches the results seen above. All in all, I think the dataset is too small to demonstrate this technique. But, considering the chance that the complexity might not be linear with the performance benefit, it's still interesting. Even though this tangent is a big off-topic, it is often a great idea to push as much work into the database as you can if applicable. Especially if it means you can transfer a lot less data eventually. tl;dr; If you use the django.views.decorators.cache.cache_control decorator, consider this one instead to change the max_age depending on the request. But, that number 60 * 60 I really needed it to be different depending on the request parameters. For example, that oc=None, if that's not None I know the page's Cache-Control header can and should be different. allow the `max_age` parameter be a callable. # Can't re-use, have to create a shallow clone. tl;dr; I wrote my own extension to django-pipeline that uses Zopfli to create .gz files from static assets collected in Django. Here's the code. What I wanted was to continue to use django-pipeline which does a great job of reading a settings.BUNDLES setting and generating things like /static/js/myapp.min.a206ec6bd8c7.js. It has configurable options to not just make those files but also generate /static/js/myapp.min.a206ec6bd8c7.js.gz which means that with gzip_static in Nginx, Nginx doesn't have to Gzip compress static files on-the-fly but can basically just read it from disk. Nginx doesn't care how the file got there but an immediate advantage of preparing the file on disk is that the compression can be higher (smaller .gz files). That means smaller responses to be sent to the client and less CPU work needed from Nginx. Your job is to set gzip_static on; in your Nginx config (per location) and make sure every compressable file exists on disk with the same name but with the .gz suffix. In other words, when the client does GET https://example.com/static/foo.js Nginx quickly does a read on the file system to see if there exists a ROOT/static/foo.js.gz and if so, return that. If the files doesn't exist, and you have gzip on; in your config, Nginx will read the ROOT/static/foo.js into memory, compress it (usually with a lower compression level) and return that. Nginx takes care of figuring out whether to do this, at all, dynamically by reading the Accept-Encoding header from the request. The best solution today to generate these .gz files is Zopfli. Zopfli is slower than good old regular gzip but the files get smaller. To manually compress a file you can install the zopfli executable (e.g. brew install zopfli or apt install zopfli) and then run zopfli $ROOT/static/foo.js which creates a $ROOT/static/foo.js.gz file. So your task is to build some pipelining code that generates .gz version of every static file your Django server creates. At first I tried django-static-compress which has an extension to regular Django staticfiles storage. The default staticfiles storage is django.contrib.staticfiles.storage.StaticFilesStorage and that's what django-static-compress extends. But I wanted more. I wanted all the good bits from django-pipeline (minification, hashes in filenames, concatenation, etc.) Also, in django-static-compress you can't control the parameters to zopfli such as the number of iterations. And with django-static-compress you have to install Brotli which I can't use because I don't want to compile my own Nginx. So I wrote my own little mashup. I took some ideas from how django-pipeline does regular gzip compression as a post-process step. And in my case, I never want to bother with any of the other files that are put into the settings.STATIC_ROOT directory from the collectstatic command. Here's my implementation: peterbecom.storage.ZopfliPipelineCachedStorage. Check it out. It's very tailored to my personal preferences and usecase but it works great. To use it, I have this in my settings.py: STATICFILES_STORAGE = "peterbecom.storage.ZopfliPipelineCachedStorage"
Why not try to get this into django-pipeline or into django-compress-static. The answer is frankly laziness. Hopefully someone else can pick up this task. I have fewer and fewer projects where I use Django to handle static files. These days most of my projects are single-page-apps that are 100% static and using Django for XHR requests to get the data. When you want to lock a function from more than 1 call at a time. two "identical" calls to some_internet_fetching and if the database didn't have the name already, it will most likely trigger two calls to Thing.objects.create(name=name, ...) which could lead to integrity errors or if it doesn't the whole function breaks down because it assumes that there is only 1 or 0 of these Thing records. Now, thanks to Redis distributed locks, the function is always allowed to finish before it starts another one. All the hairy locking (in particular, the waiting) is implemented deep down in Redis which is rock solid. If you just put @lock_decorator() on this Django view function, and you have some (almost) concurrent calls to this function, for example from a uWSGI server running with threads and multiple processes, then it will not synchronize the calls. I started a Django server with uWSGI with multiple processors and threads enabled. Then I bombarded this function with a simple concurrent stress test and observed the requests per minute. The cost was extremely tiny and almost negligable (compared to not using the lock decorator). Granted, in this test I used Redis on redis://localhost:6379/0 but generally the conclusion was that the call is extremely fast and not something to worry too much about. But your mileage may vary so do your own experiments for your context. You need to use django-redis as your Django cache backend. I've blogged before about using django-redis, for example Fastest cache backend possible for Django and Fastest Redis configuration for Django. The project seems to have become a lot more popular than I thought it would. It started as a one-evening-hack and because there was interest I wrapped it up in a proper project with "docs" and set up CI for future contributions. Thank you all who contributed! I'll try to make a better job noticing filed issues in the future.